Texas Instruments has developed a new technology that can make head-up displays (HUD) in cars bigger and brighter. The new DLP chip that Texas Instruments has made uses polarized glasses to create HUDs having brighter, bigger images. The graphics appear further out in front of the car and thus minimize driver distraction. They even appear to “paint” the road with driving directions and useful information. As the display is translucent, it does not in any way affect the driver’s view of the road and there is minimal need for the driver to look down at the instrument cluster. 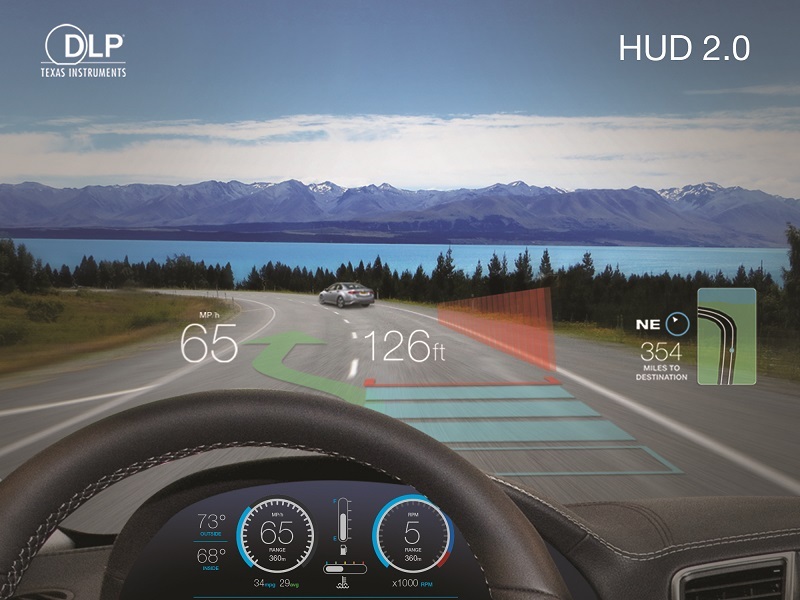 HUD technology has become more and more popular in recent years, especially in luxury models. While conventional HUD units rely on an LCD image that is reflected onto the windshield, the Digital Light Processing chip (DLP) from Texas Instruments actively projects the image onto the windshield. The latest HUDs come with color graphics and the new technology has been used in the latest Lincoln continental and Navigator models. Jeff Dickhart, Texas Instruments’ general manager of DLP automotive products that some automotive manufacturers are thinking of making head-up displays the primary driving display and they could replace the traditional instrument cluster a few years down the line. Dickhart said that the new DLP chip for HUDs, which is called the DLP3030-Q1, “reduced the package size by over 60 percent”. Hence, it is now easier for automotive manufacturers to install the HUD in the dashboard of a car. When it comes to LCD-based HUDs, the LCD can’t be bigger than the dashboard and this limits the size of the graphics. This does not apply when the chip is used. Other benefits of the chip are its low power usage and automotive testing, which showed that the chip can tolerate temperatures ranging from minus 40 all the way up to 221 degrees. Dickhart also said that the DLP has the fastest switching MEMs device in the world. This refers to “MEMs” meaning microelectromechanical, or the array of tiny mirrors used for the projection technology. The ability to change imagery quickly is important when it comes to augmented reality applications, like scenarios where a camera is used to detect the presence of pedestrians at night. The HUD could highlight such a pedestrian or an animal on the road with a graphic on the windshield. Lincoln has signed an exclusive deal with Texas Instruments to use its DLP technology for automotive HUDs. Lincoln spokeswoman Amanda Park described the HUD based on the DLP chip as “the brightest and biggest display size in its class.” If the technology can be made cost-effective, we should be seeing it soon in other model segments also.